This is the keyboard version of the MADAS VII Max, very much like the VII eT that I sold, except then with a manual crank, and without the electric motor (and no DIV STOP key). 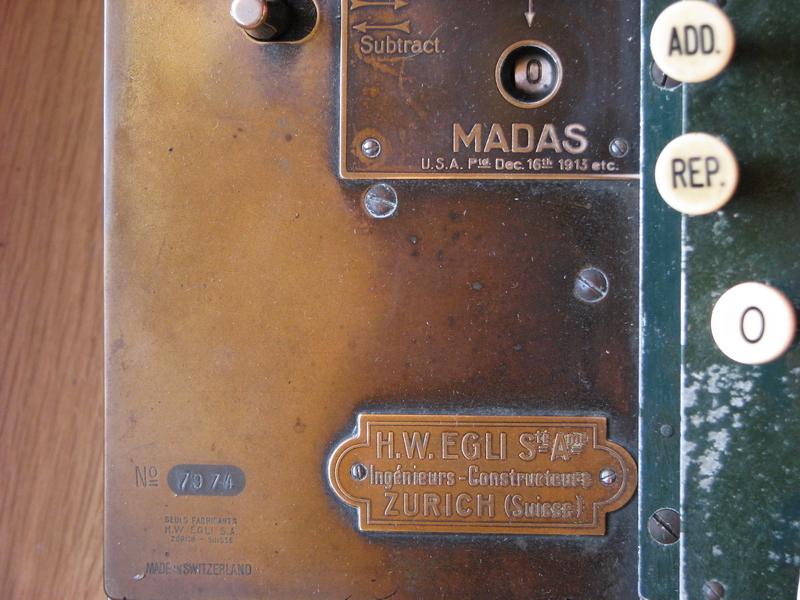 With serial number 7974, it dates back to the early 20s, probably 1922-1924. 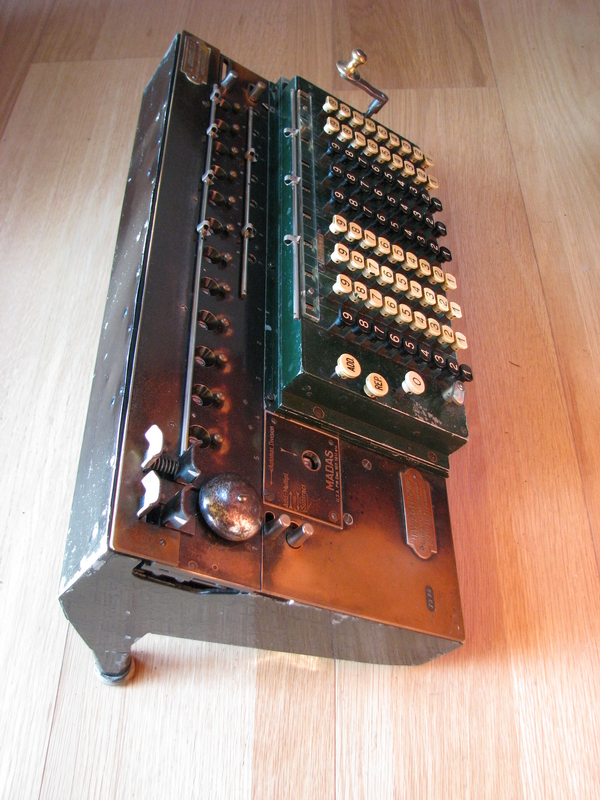 It belonged to a Belgian insurance company, the Assurances Générales Vie, where it was handed down to a young employee in 1945, already after a number of years of faithful service. 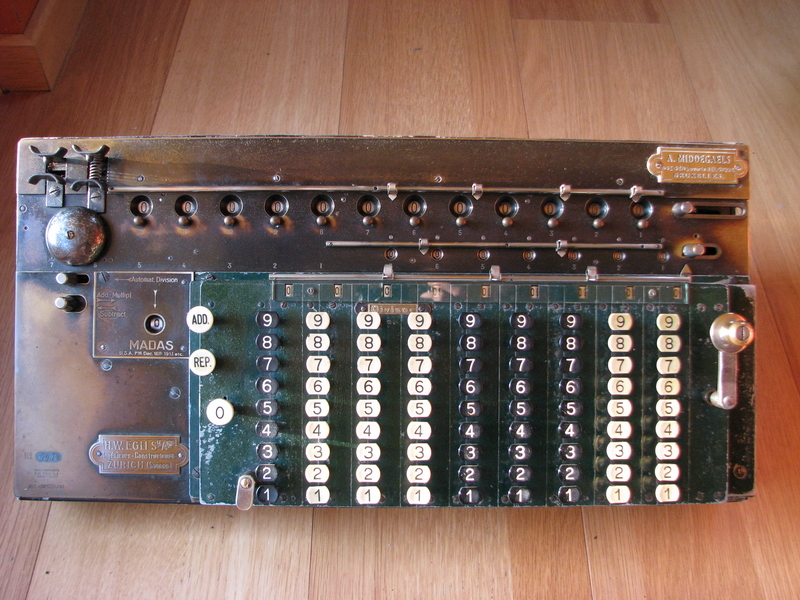 The young lad stayed with the company over the course of his entire career, and probably wore out a number of calculators doing life insurance calculations - to calculate benefits and monthly cost for life insurance, based on actuary tables. Sometimes simply debt insurance, sometimes life insurance policies, speculating on life, sometimes based on two heads, or even four heads - in his own words "just fun little calculations like that". 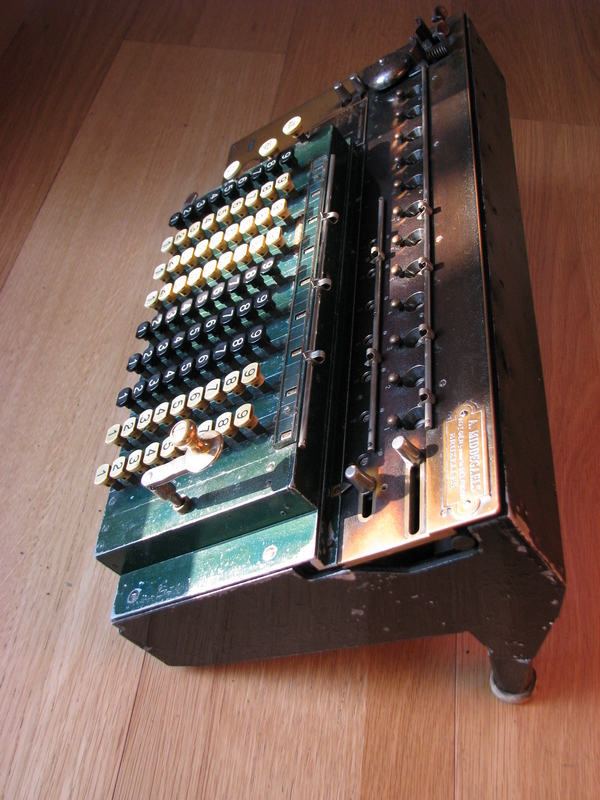 When he retired in 1987, his collegues gave him this - his own first calculator - as a goodbye present. Now, another 27 years later, at the age of 87, he did not have much use for it anymore and decided to sell it. He contacted the ANCMECA in France, as this is where he now lives, but he also has a house in Belgium, which is literally right around the corner from where I work. I stopped by when he returned to Belgium, and offered him a fair price, as he had no idea whatsoever what the machine would be worth. 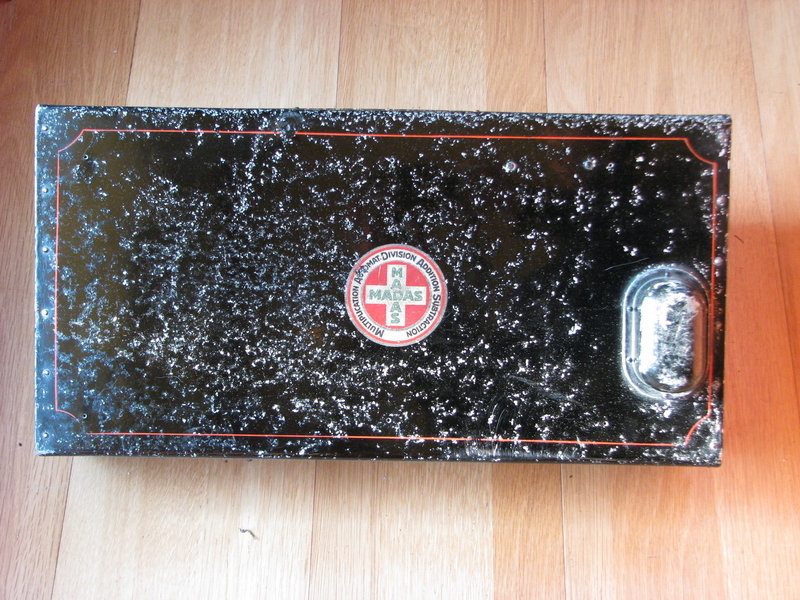 The case and keyboard had probably been repainted at some point, and the calculator was "overhauled" by an idiot who did not know what he was doing - as they are so often. 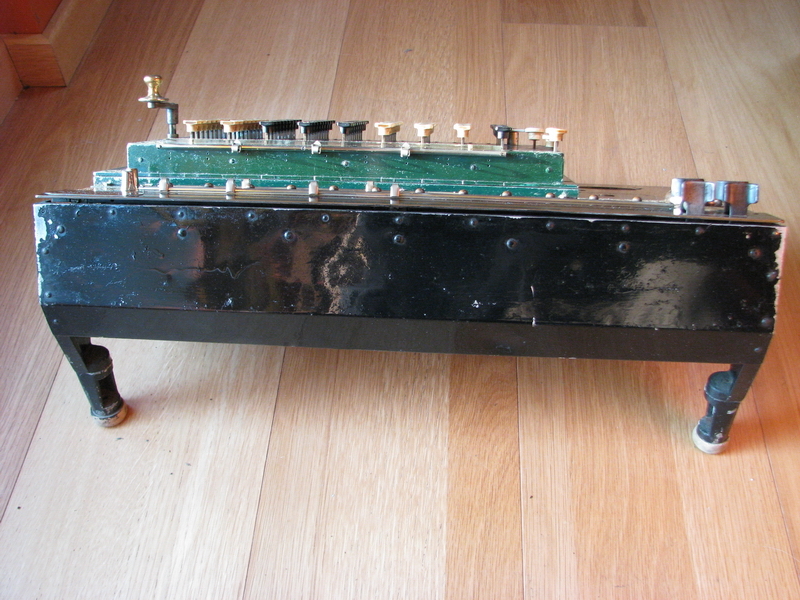 It was reassembled in such a way that the carriage top plate was laying on top of two of the three guiding pins, which obviously made it very stiff to move, as the brass top plate was under constant torsion. It took considerable disassembly to make this right, but as soon as everything clicked in place, the carriage slid from left to right like greased lightning. Apart from this small issue, the machine was complete and working. A good clean up made it as nice as it is now. 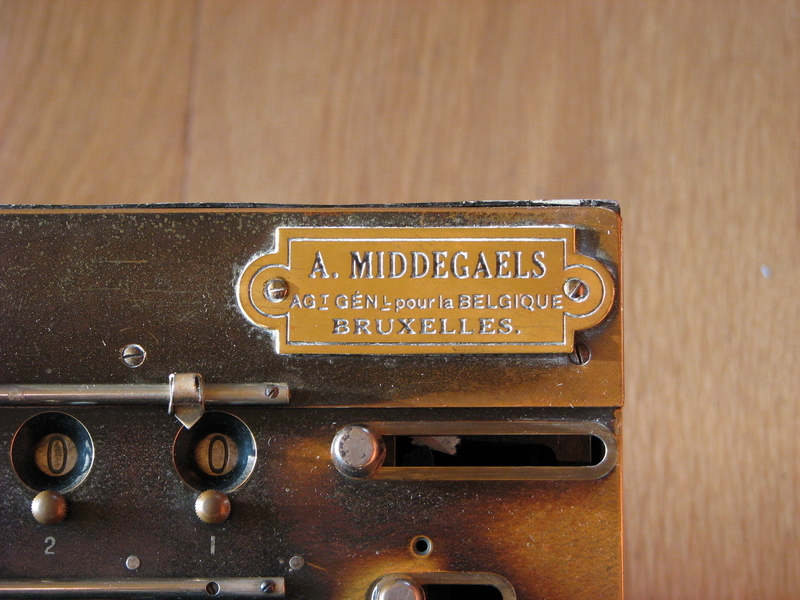 Seller's plate, A. Middegaels, in Brussels.